So today I’m happy to announce that I’m trading blogs with a very cool blogger, runner, exerciser lady – Jenna over at Little Green Running Shoes! We decided we’d each write about the lessons we learned from our first big distance race. 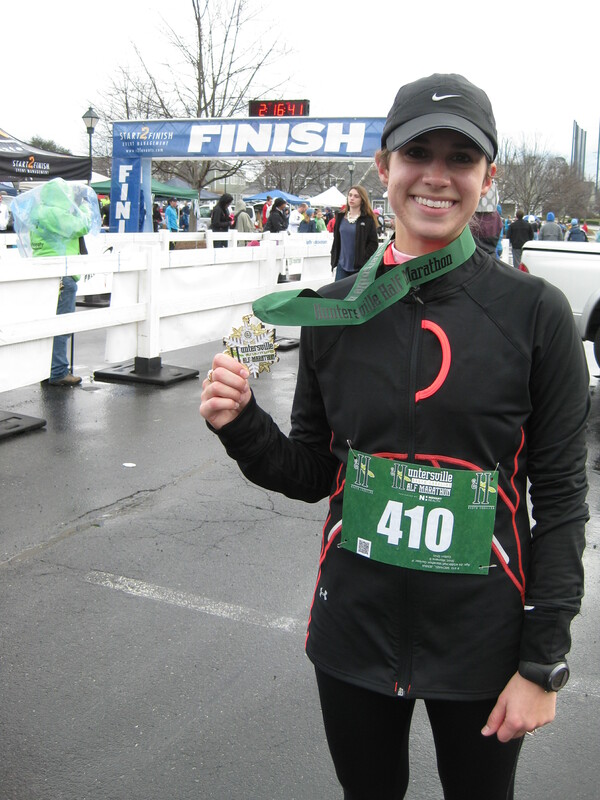 Here’s her take on her recent successful first half marathon! Please show her lots of love in the comments section – I know she’d love your feedback! I completed my first half marathon about two months ago and loved every minute of it. After finishing my race and coming down from my runners high, I realized there were several things I wish I had known before I started training. I have never been a good or fast runner, but I am dedicated. 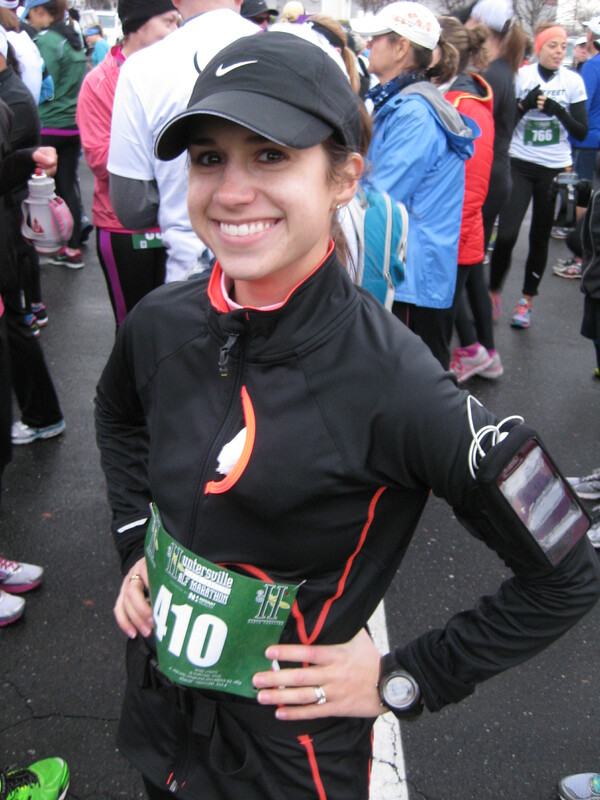 When I committed to running this half marathon, there was nothing that would stand in my way of finishing. I just didn’t realize how much time it would take. Weekends had to be scheduled around long training runs, and weekday workouts had to complement training while not over-exerting. I spent a majority of my free time mapping routes and planning my next run. I added two extra weeks to my training program “just in case” and ended up needing the time. One weekend, I was sick and couldn’t go on my long run, and another weekend was a torrential NC storm (I don’t like treadmills). Running a half marathon is considerably time consuming. Running pushes you to the limit. It’s why so many people love it and also why there is a multi-billion dollar industry around it. Training for a half marathon pushed my body to boundaries I didn’t know I had. You are constantly recovering from your last run while planning for your next. Your body is tired and sore most of the time but seeing the miles add up makes it all worthwhile. While I was running my race, my left foot began to bother me. It wasn’t until after I had cooled down that I realized how intense the pain actually was. I ended up having some sort of a micro-stress fracture in my fifth metatarsal which is a very common injury for runners. I blamed my shoes at first, thinking they were not supportive enough. 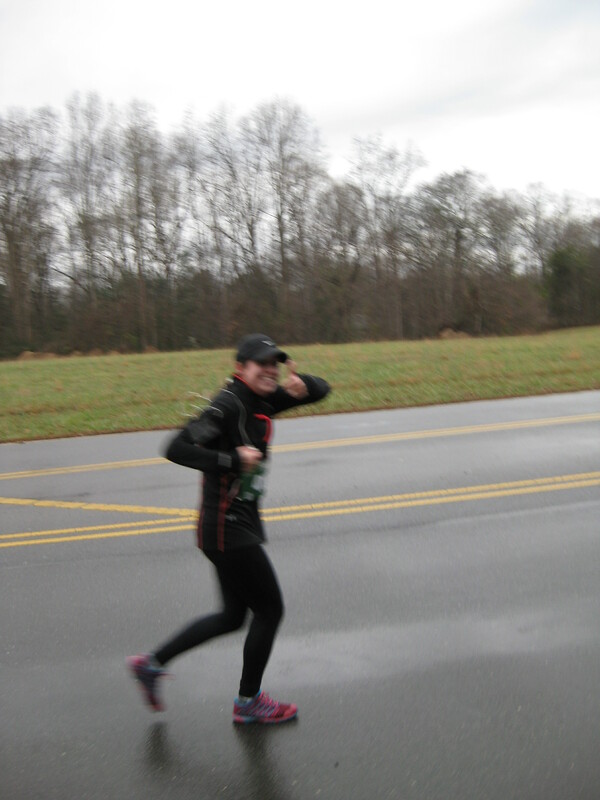 Next I blamed my gait, maybe I was running awkwardly? My shoes and gait were fine but my nutrition was not. I did not supplement my diet properly. I increased calories and healthy carbs but forgot about fish oils and calcium. When it comes time to train for the next race, I will definitely be taking more supplements! Tapering is the reduction of mileage within a certain amount of time leading up to a race. Anyone participating in a long distance race should taper in order to allow the body enough recovery time. The main purpose is to replenish the glycogen levels in your muscles and allow time for tissue repair. Marathon runners are advised to have two to three weeks of tapering while half marathoners only need one to two weeks. Opinions vary on how much you should taper, and it may become a personal preference. One major problem that many runners seem to find during their taper time is over-eating. As distance runners, we get used to eating a larger amount of calories due to a faster metabolism and higher daily caloric burn. During the taper, runners need to adjust their diet accordingly while still drinking plenty of water. Tapering is the ideal way to ensure your body is fully rested and capable of optimum performance for long distance racing. Not everyone believes in tapering, but it worked for me. I ran faster than I anticipated and did not fatigue until my last mile. Only people who have completed a half marathon can really explain how fun it is. Training, supplementing, cross-training, tapering, and everything else becomes habitual and enjoyable as time progresses. I loved every minute of this adventure and can’t wait to do it again. Running a half marathon is a journey that will push you to your limits and test your perseverance. It will also show you things about yourself you never knew, and open you up to a whole new world of adventures. Have patience with yourself and your body, success isn’t something that happens overnight but is worth working for. Always stay positive and keep the finish line in sight! I just noticed that since I have re-started blogging, that I’m up to 100 posts. 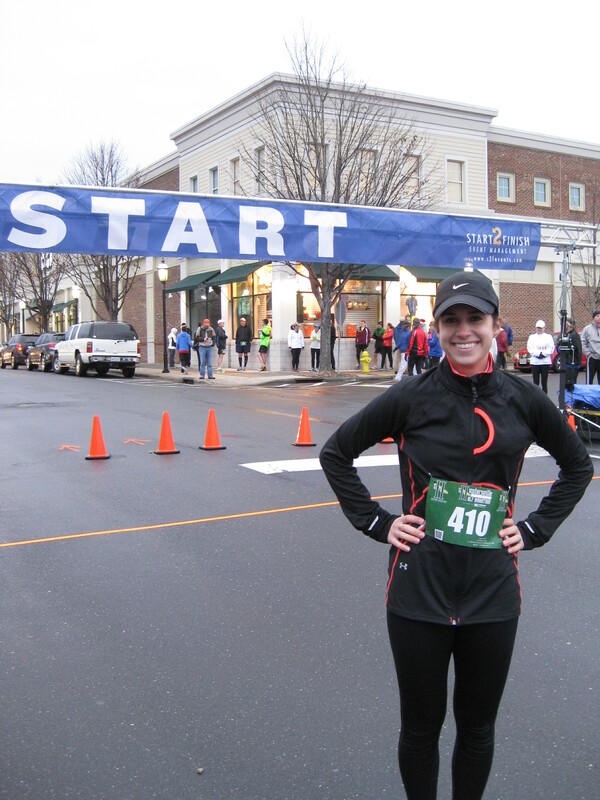 For those who don’t know, I originally started my blog when I signed up for my first marathon back in 2007. I started it because once word got out what I was doing, it became multiple daily discussions from people asking me how the training was going. I was repeating myself alot. Now I like to talk and be the center of attention as much as the next egomaniac, but it was getting a bit old, so I decided to start the blog and let people keep tabs on my training that way. It worked great (even though my training wasn’t great – see the painful results below). 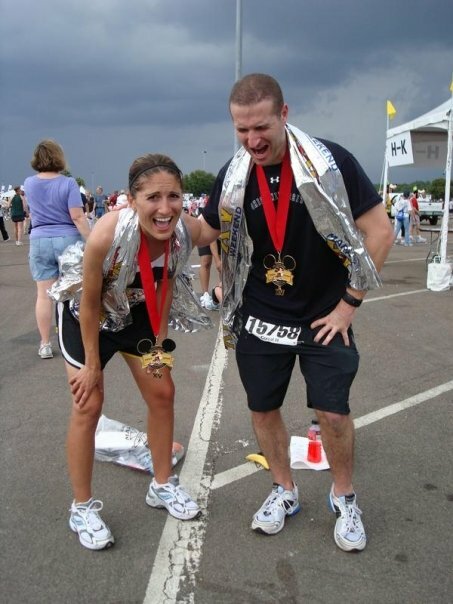 My sis and I after our first marathon – I think the looks on our faces capture the feels of our bodies. I kept that blog going for a few years, and really enjoyed it, but then one day I had a mini freak out about my personal thoughts being on the internet – so I deleted EVERYTHING on the blog. Years and years of posts, gone. But, after a couple year hiatus, I decided to restart it. So here we are. I enjoy writing, always have. 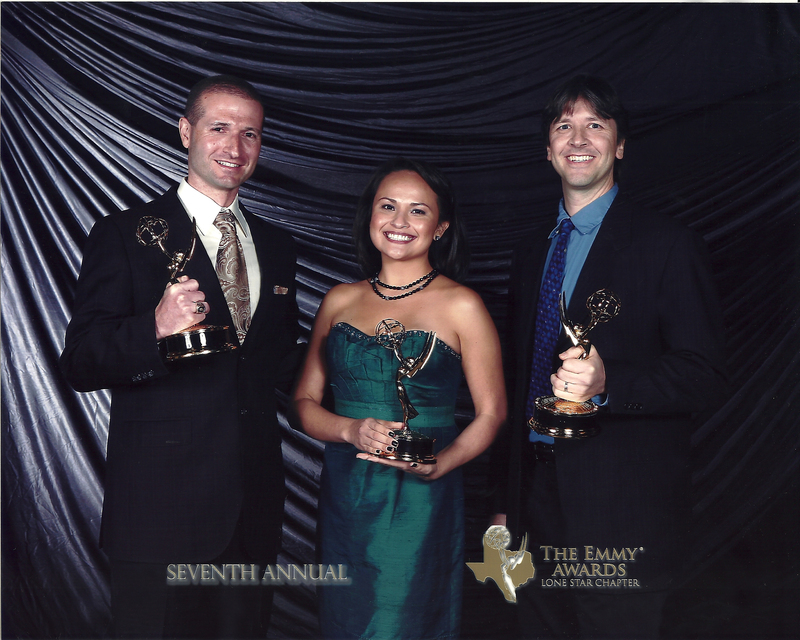 Heck, I’ve even won an Emmy for my writing (nominated twice). And through this blog I’ve gotten to virtually meet some other great bloggers, have picked up some good tips, and hopefully shared some good information. This time around though, I’ve been more selective about what I share and don’t. So if you’re keeping tabs on my training, looking for advice, appreciate my sense of humor, or are just a stalker – Thanks for being part! Until next time internet, peace out!